Fighting between US forces and Shia insurgents across Baghdad's Sadr City suburb has left at least 34 dead. 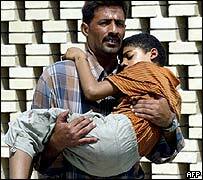 Clashes in the last 24 hours also injured at least 170 Iraqis, health officials said. One US soldier is among the dead and several were wounded. Another US soldier was killed by small arms fire in another part of Baghdad on Tuesday afternoon, the US army said. Also in Baghdad, the city's governor narrowly escaped assassination in an attack on his convoy. Loud explosions and gunfire were heard across Sadr City throughout Monday night and Tuesday morning, as US fighter jets flew overhead. The area is a bastion of radical cleric Moqtada Sadr, who recently called on followers to observe a ceasefire. Mr Sadr's Mehdi Army militia has been involved in numerous clashes with US-led forces in Iraq in recent months. A peace deal in August ended weeks of fighting in the southern city of Najaf, but sporadic fighting has continued elsewhere. Many Sadr militiamen are believed to have since returned from Najaf to Sadr City - a heavily-populated slum in north-east Baghdad named after Mr Sadr's father, a senior cleric assassinated in 1999 reportedly on Saddam Hussein's orders. A US army captain quoted by Associated Press said the American soldier killed in Sadr City was shot when militants attacked troops carrying out routine patrols. "We just kept coming under fire," Capt Brian O'Malley said. 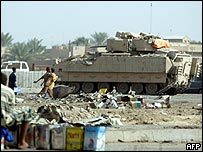 A spokesman for Mr Sadr blamed intrusive American incursions into the area for the violence, and said his forces "had no choice but to return fire". Separate roadside bombs in Baghdad a day earlier killed three American soldiers, the US military said on Tuesday. A fourth soldier died in a blast near Mosul on the same day. The latest attacks bring the number of Americans killed in Iraq on Monday and Tuesday to 13 and the total number since the March 2003 invasion to nearly 1,000. In addition to the attack on the Governor of Baghdad, the son of the governor of the northern province of Niniveh was killed in a drive-by shooting, hospital officials said. Nineteen-year-old Leith Dureid Kashmula was hit by two bullets in the chest and rushed to hospital where he died of his injuries, hospital staff in Mosul said. He had been alone in the car in the west of the city when he was attacked. The current governor's predecessor was assassinated in July. "The American casualties keep coming"